Philippine Animal Welfare Society or PAWS maybe on it's heat after knowing this breaking news wherein a government employee, specifically a DepEd staff abuse a dog by hitting it many times using a baseball bat at Tayuman, Manila. The DepEd's staff is named Mel Reyes, according to a report made by ABS-CBN. Now, the dog's owner, Norma Eustaquio will file a case against Reyes in abusing the dog. The dog got sprain bones and his/her eyes pop out due to the hits he/she got from the baseball bat. According to the accuse, they were just got angry because the dog have bitten their mother on her left thigh. Mel Reyes said, "Silakbo ng damdamin ng aking kapatid bilang isang anak. Kung makikita mo ang nanay mo na humihingi sayo ng tulong.. na sinakmal siya ng aso." But according to PAWS, even though that the dog have bitten Reyes' mother, they still don't have the rights to hurt the dog. It says in an animal welfare act, "Any person who violate, any of the provisions of this act shall, upon conviction by final judgment, be punished by imprisonment of not less than six (6) months nor more than two (2) years. Ana Cabrera of PAWS said, "Yung pagpapalo walang excuse for that it's still cruelty. Maaaring sana ginawa n lng nya sa legal na paraan." I'm an animal lover, though I don't judge the actions made by the person who have hurt the dog, but I hope that this issue could be a great lesson to everyone that having an outburst of anger won't settle anything in any good way. Thank you for reading, God Bless!! 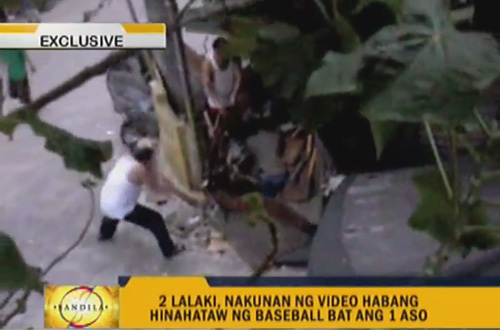 Comments or suggestions about "DepEd employee caught on cam hitting a dog with a bat" is important to us, you may share it by using the comment box below.